Used for receptions, luncheons, larger formal dinners, and state dinners for visiting heads of state on state visits, now you can sit down and take your photo sitting at this true replica of the state dining table! 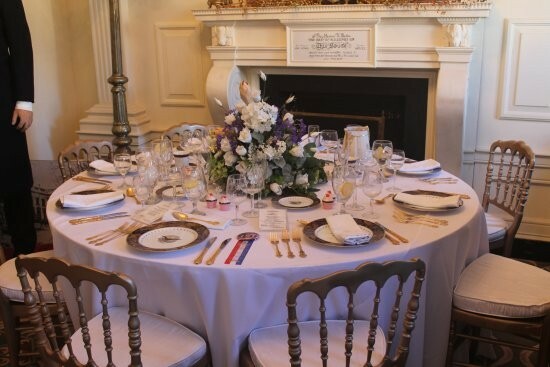 The State Dining Room is the larger of two dining rooms on the State Floor of the Executive Residence of the White House, the home of the President of the United States in Washington, D.C. It is used for receptions, luncheons, larger formal dinners, and state dinners for visiting heads of state on state visits. The room seats 140 and measures approximately 48 by 36 feet (15 by 11 m). Originally office space, the State Dining Room received its name during the presidency of James Monroe, at which time it was first extensively furnished. The room was refurbished during several administrations in the early to mid 1800s, and gasified in 1853. Doors were cut through the west wall in 1877. The State Dining Room underwent a major expansion and renovation in 1902, transforming it from a Victorian dining room into a "baronial" dining hall of the early 19th century—complete with stuffed animal heads on the walls and dark oak panelling. The room stayed in this form until the White House's complete reconstruction in 1952. The 1952 rebuilding of the White House retained much of the 1902 renovation, although much of the "baronial" furnishings were removed and the walls were painted celadon green. Another major refurbishment from 1961 to 1963 changed the room even further, more closely approximating an Empire style room with elements from a wide range of other periods. Incremental changes to the room were made throughout the 1970s and 1980s, with major refurbishments of the furnishings in 1998 and 2015.